Overall Assessment: African Botanics is an innovative, visionary and trail-blazing luxury anti-aging skincare and wellness line that makes remarkably effective products that are a joy to use. 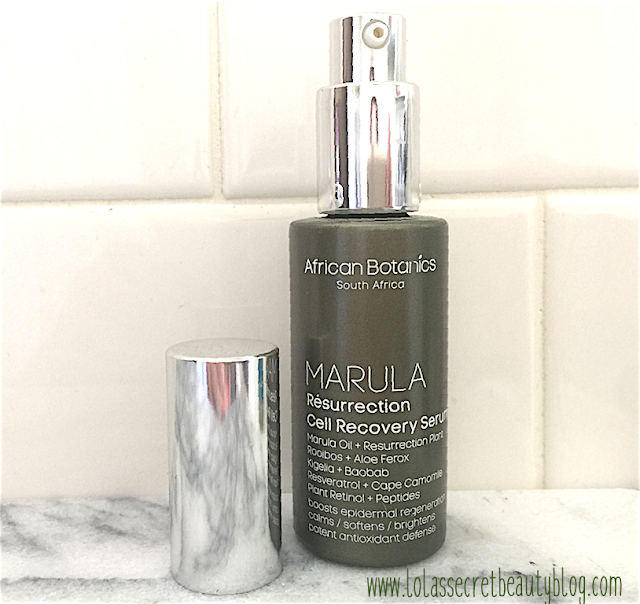 African Botanics Resurrection Cell Recovery Serum is the perfect antioxidant-rich, anti-aging gel-like, nighttime serum that is ultra-effective, and delivers on its promises with tangible results. If you want to take it to a whole other level, then pair this with African Botanics Fleur d'Afrique Intensive Recovery Oil, and you will immediately understand why they are my go-to, must-have Holy Grail nighttime treatments. $160.00 for 1 oz./30ml. from African Botanics, Net-A-Porter, Violet Grey, Credo Beauty, and Cult Beauty ( £132.00) (Affiliate Links). The serum sounds absolutely fantastic with everything in it! It really, truly is. It is so effective, and the results can be seen very quickly! This sounds amazing. I need something potent to plump the lines under my eyes which are becoming increasingly noticeable. It really is an amazing serum, and it really does just what it claims to do! This serum is certainly packed with so many skin nutrients! It most definitely is! It's a really amazing serum! I wonder why SpaceNK isn't carrying these two new products. Hopefully they will soon, since they are carrying the new balm! They really should because their customers are really missing out on two of the finest skincare products on the market! It really is amazing, Babi! It does precisely what it claims to do, and is filled with healthy ingredients. African Botanics is a definite game-changing line! You've made everyone so interested in African Botanicals. Does the line have fragrance? I can't remember. Thank you for saying such lovely things, Marcia! It is such an exquisite line, and I think that everyone should know about it! Their products are unbelievably effective, and they are free of all harmful ingredients. They don't add any artificial fragrances, but you can smell the natural aromas of the ingredients. It really is, and I have to say that I am quite obsessed with this serum! That serum looks like something my skin could love. I suspect that your skin would be deliriously happy with this magical serum! Wow, a game changer! You know I have to have this! It definitely is a game changer, twinsy! I know how you love a good serum, and this one would definitely impress you! I can't use this right now, because I'm nursing and some of the ingredients are off limits. But, it sounds fabulous!! It's definitely well worth trying when you are no longer nursing, Julie! Why is this only for night? What do you use in the am in conjunction with the Recovery Oil? Thanks. Because of the Retinol. Generally, and with most retinoid-based products, it is suggested that the active nature in exfoliating, is best used at night when skin-cell turnover is the highest. It is also a good idea to use a high SPF sunscreen during the day when using products with retinol in them. I see. Thanks. I just started using this but I think it is making me break out. It's either this or the oil. I'm really to old for that to happen, so not sure what is happening. Hi Cindy, Were you breaking out when you used the oil alone? If so, it's probably not the oil. If it started with this, then try to spot test it alone somewhere on your face or neck to see if you are actually having an allergic reaction to this product. That's what I always do if I have any sort of reaction.